This sign is for Coca Cola Buvez. The sign’s colors are yellow, red, white, and black. 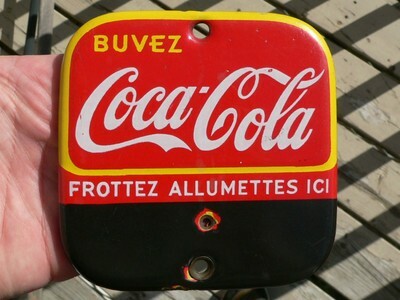 The text on the sign reads: Buvez Coca Cola Frottez Allumettes Ici. The sign shows text with the logo in the center and the match strike below.